DIE Jovis, 31 die Januarii. Bill to suppress Atheism, &c.
L. North takes his Seat. L. Mordant's Manner of Trial. Message from H. C. to return Pride's Bill. D. of Bucks and E. of Rutland, concerning the Title of L. Roos. The Earl of Dorsett reported, "That the Committee have considered the Bill to make Sale of Lands, for the Payment of the Debts of Henry Kendall Esquire; and they think it fit to pass as it is, without any Amendments." 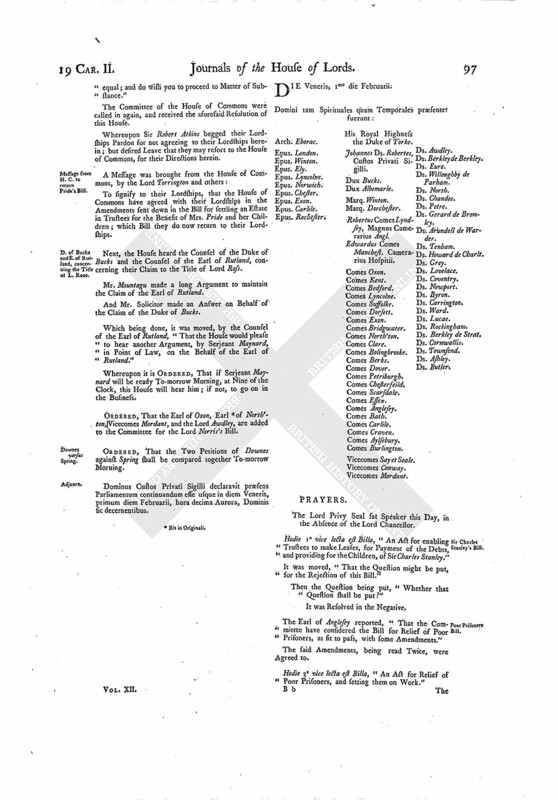 Hodie 3a vice lecta est Billa, "An Act to make a Sale of Lands, for the Payment of the Debts of Henry Kendall Esquire." The Earl of Dorset reported, "That His Majesty hath been pleased to grant the Desires of both Houses, concerning the Goods of the French Merchants." ORDERED, That the Committee for the Lord Norris's Bill do meet this Afternoon, at Four of the Clock. 1. "An Act to prevent the Disturbances of Seamen and others; and to preserve the Stores belonging to His Majesty's Navy Royal." 2. "An Act for punishing and suppressing of Atheism, Prophaneness, and prophane Cursing and Swearing." Hodie 1a vice lecta est Billa, "An Act for punishing and suppressing of Atheism, Prophaneness, and prophane Cursing and Swearing." This Day Dudly Lord North presented his Writ of Summons to Parliament to the Speaker, upon the Decease of his Father Dudly Lord North; and accordingly took his Place on the Barons Bench. The Committee of the House of Commons that were appointed to manage the Evidence against the Lord Viscount Mordant upon his Impeachment, were admitted to the Bar (the Lord Viscount Mordant sitting near the Bar, upon a Stool, uncovered). "1. Concerning Counsel not to be allowed to the Lord Viscount Mordant. "2. Concerning his standing without the Bar. "Touching the First, the Commons do acquiesce in their Lordships Resolution, for admitting him Counsel in this Cause, that so he may want no Help for his Defence, though the contrary hath been a Favour not denied to the House of Commons formerly. 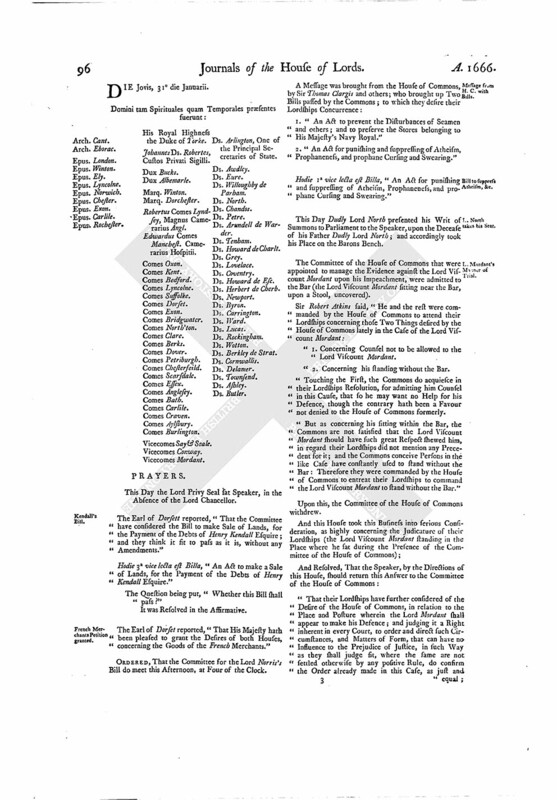 "But as concerning his sitting within the Bar, the Commons are not satisfied that the Lord Viscount Mordant should have such great Respect shewed him, in regard their Lordships did not mention any Precedent for it; and the Commons conceive Persons in the like Case have constantly used to stand without the Bar: Therefore they were commanded by the House of Commons to entreat their Lordships to command the Lord Viscount Mordant to stand without the Bar." Upon this, the Committee of the House of Commons withdrew. "That their Lordships have further considered of the Desire of the House of Commons, in relation to the Place and Posture wherein the Lord Mordant shall appear to make his Defence; and judging it a Right inherent in every Court, to order and direct such Circumstances, and Matters of Form, that can have no Influence to the Prejudice of Justice, in such Way as they shall judge fit, where the same are not settled otherwise by any positive Rule, do confirm the Order already made in this Case, as just and equal; and do wish you to proceed to Matter of Substance." The Committee of the House of Commons were called in again, and received the aforesaid Resolution of this House. Whereupon Sir Robert Atkins begged their Lordships Pardon for not agreeing to their Lordships herein; but desired Leave that they may resort to the House of Commons, for their Directions herein. To signify to their Lordships, that the House of Commons have agreed with their Lordships in the Amendments sent down in the Bill for settling an Estate in Trustees for the Benefit of Mrs. Pride and her Children; which Bill they do now return to their Lordships. Next, the House heard the Counsel of the Duke of Bucks and the Counsel of the Earl of Rutland, concerning their Claim to the Title of Lord Ross. Mr. Mountagu made a long Argument to maintain the Claim of the Earl of Rutland. And Mr. Solicitor made an Answer on Behalf of the Claim of the Duke of Bucks. Which being done, it was moved, by the Counsel of the Earl of Rutland, "That the House would please to hear another Argument, by Serjeant Maynard, in Point of Law, on the Behalf of the Earl of Rutland." Whereupon it is ORDERED, That if Serjeant Maynard will be ready To-morrow Morning, at Nine of the Clock, this House will hear him; if not, to go on in the Business. ORDERED, That the Earl of Oxon, Earl (fn. 1) of North'ton, Vicecomes Mordant, and the Lord Awdley, are added to the Committee for the Lord Norris's Bill. ORDERED, That the Two Petitions of Downes against Spring shall be compared together To-morrow Morning. Dominus Custos Privati Sigilli declaravit præsens Parliamentum continuandum esse usque in diem Veneris, primum diem Februarii, hora decima Aurora, Dominis sic decernentibus.